If you or someone you love has ever had a migraine, you know how totally debilitating that condition can be. A migraine is not just a headache. And instead of simply impacting the person who unfortunately has the migraine, loved ones, friends, family members and coworkers are often affected as well. From mildly unpleasant to causing someone to be unable to live a normal life, migraines are unfortunately experienced by about 15% of people in modern, industrialized nations. That means between 5 or 6 of your friends, one of you has experienced, or will experience, a migraine this year. Fortunately, there are things you can do to limit your exposure to this emotionally and physically painful situation. Incidentally, migraines are not the only types of headaches that lead to a lower quality of life. Since there are a number of significant headache conditions, it makes sense to understand how they all develop, what causes them, how to limit your risk, and how to effectively treat symptoms once they develop. Once you master the secrets to preventing and treating migraines and other painful headaches, you minimize your suffering, and maximize the possibility that you can avoid these crippling conditions entirely. As many as 37 million Americans will have at least one migraine experience this year. The National Headache Foundation believes more than 50% of those who suffer from serious migraines have never been diagnosed. A migraine may last only 4 hours, and as long as 3 entire days. Women are more likely to get a migraine, and the “sweet spot” is between 15 and 55 years of age. 3 of the most common migraine triggers are alcohol, caffeine and certain foods. Look at that last migraine statistic. If you drink alcohol or caffeine regularly, especially to excess, migraines and other painful headaches could be your reward. Certain foods also cause migraines in some people, and not others. Understanding which foods can begin the migraine process is vital to avoiding those particular foods, and other triggers, to keep you migraine-free. In rare cases you may develop a severe fever. Remember, these symptoms can last for as few as 4 hours, and as long as a continual 72 hours. By the way, those debilitating conditions are just the most commonly produced migraine symptoms. If you have a tension headache, cluster headaches, sinus headaches or rebound headaches, there are more painful and restricting symptoms you may experience. What is the answer to making sure you experience the fewest number of headaches in your life as you possibly can? You need to understand what triggers migraine and other serious headaches. You need to see how those triggers affect you personally, how to avoid them, and you should also have effective treatment methods that work quickly to relieve symptoms of migraines and other headaches. When you know why something happens, you can predict when it is going to happen in the future. In the case of migraines and other serious headaches which can put you flat on your back for up to 3 days, incapable of performing the simplest day-to-day activities like tying your shoes, preparing meals or even walking, you want to avoid these experiences if at all possible. 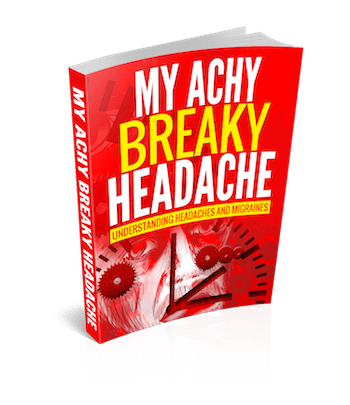 That is exactly what the report My Achy Breaky Headache: Understanding Headaches and Migraines gives you, the ability to predict and prevent debilitating headaches, and to quickly and effectively treat them once they develop.